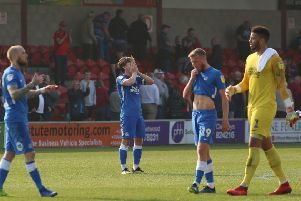 Posh midfielder Chris Forrester (right) should be back in action at Wigan. Peterborough United are confident of putting on a good show at the home of the best team in League One tomorrow (January 13). Posh travel to leaders Wigan, a team with just three defeats all season, but one them was a 3-2 reverse in a cracking contest at the ABAX Stadium in September. And Posh are ready to go toe-to-toe again with their gifted opponents. Manager Grant McCann won’t employ the negative tactics Charlton and Shrewsbury used to get 0-0 draws at the DW Stadium recently. “We’re looking forward to this game,” McCann said. “It’s two good teams who play attractive football and it will take place on a big pitch that will suit us both. “Wigan showed their quality in the first half at our place. That was the best football played against us all season. They are the best team I’ve seen, but we rallied and beat them that day. “They will be keen to get one over us after what happened then, but we are not going up there to sit back. They will know all about us as everyone is talking about our attacking players, but we know all about their players as well. “We are confident we will give a good account of ourselves. We will try and control possession, get after them and create chances. “We’ve tended to perform well against the better teams, but then our performances in all competitions have generally been good over the last 20 matches. New signing Joe Ward, a winger from Woking, is likely to start on the substitutes’ bench. Midfielder Leo Da Silva Lopes is a doubt with a hamstring issue, but top scorer Jack Marriott is fit despite suffering a bruised foot in Tuesday’s Checkatrade Trophy win at Luton. Chris Forrester is available after serving a suspension at Luton and will return in place of Da Silva Lopes. Michael Doughty or Jermaine Anderson are likely to replace Junior Morias from the Luton starting line-up, while central defender Steven Taylor is expected to take over from club captain Jack Baldwin.